Paleta fard Essence be an original este puternic pigmentate cu textura mata sau perlata! Paleta fard Essence be an original! eyeshadow box sunt 10 culori in paleta. Fati propria poveste de dragoste ce este pe cale sa inceapa cu ajutorul noului produs Paleta fard Essence be an original! 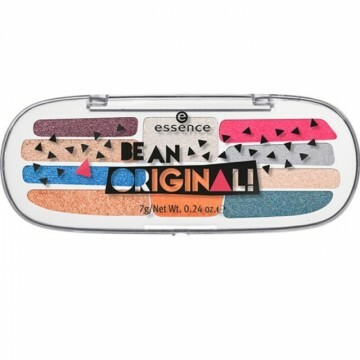 eyeshadow box dare to be bold! Paleta contine 10 texturi puternic pigmentate si ultrarezistente, ce combina nuante mate si metalice. TALC, MICA, SYNTHETIC FLUORPHLOGOPITE, TRIETHYLHEXANOIN, POLYGLYCERYL-2 TRIISOSTEARATE, C20-24 ALKYL DIMETHICONE, ETHYLHEXYLGLYCERIN, ZEA MAYS (CORN) STARCH, ZINC STEARATE, MAGNESIUM MYRISTATE, PHENYL TRIMETHICONE, ISODODECANE, SILICA, TAPIOCA STARCH, AQUA (WATER), MALTODEXTRIN, POLYMETHYLSILSESQUIOXANE, STEARIC ACID, PALMITIC ACID, LAURIC ACID, DEHYDROACETIC ACID, CI 75470 (CARMINE), CI 77266 (BLACK 2) (NANO), CI 77491, CI 77499 (IRON OXIDES), CI 77891 (TITANIUM DIOXIDE). INGREDIENTS: TALC, MICA, TRIETHYLHEXANOIN, POLYGLYCERYL-2 TRIISOSTEARATE, C20-24 ALKYL DIMETHICONE, ETHYLHEXYLGLYCERIN, ZEA MAYS (CORN) STARCH, ZINC STEARATE, MAGNESIUM MYRISTATE, PHENYL TRIMETHICONE, ISODODECANE, SILICA, SYNTHETIC FLUORPHLOGOPITE, TAPIOCA STARCH, TIN OXIDE, AQUA (WATER), POLYMETHYLSILSESQUIOXANE, STEARIC ACID, PALMITIC ACID, LAURIC ACID, DEHYDROACETIC ACID, MAY CONTAIN [+/-]: CI 77491, CI 77499 (IRON OXIDES), CI 77510 (FERRIC FERROCYANIDE), CI 77891 (TITANIUM DIOXIDE). INGREDIENTS: SILICA, TALC, SYNTHETIC FLUORPHLOGOPITE, TRIETHYLHEXANOIN, MICA, POLYGLYCERYL-2 TRIISOSTEARATE, C20-24 ALKYL DIMETHICONE, ETHYLHEXYLGLYCERIN, ZEA MAYS (CORN) STARCH, ZINC STEARATE, MAGNESIUM MYRISTATE, PHENYL TRIMETHICONE, ISODODECANE, TAPIOCA STARCH, TIN OXIDE, AQUA (WATER), POLYMETHYLSILSESQUIOXANE, STEARIC ACID, PALMITIC ACID, LAURIC ACID, DEHYDROACETIC ACID, CI 42090 (BLUE 1 LAKE), CI 75470 (CARMINE), CI 77007 (ULTRAMARINES), CI 77510 (FERRIC AMMONIUM FERROCYANIDE), CI 77891 (TITANIUM DIOXIDE). INGREDIENTS: MICA, TRIETHYLHEXANOIN, TALC, SYNTHETIC FLUORPHLOGOPITE, ZEA MAYS (CORN) STARCH, POLYGLYCERYL-2 TRIISOSTEARATE, C20-24 ALKYL DIMETHICONE, TAPIOCA STARCH, SILICA, PHENYL TRIMETHICONE, ZINC STEARATE, MAGNESIUM MYRISTATE, ETHYLHEXYLGLYCERIN, ISODODECANE, AQUA (WATER), TIN OXIDE, POLYMETHYLSILSESQUIOXANE, STEARIC ACID, PALMITIC ACID, LAURIC ACID, DEHYDROACETIC ACID, CI 15850 (RED 6), CI 15985 (YELLOW 6 LAKE), CI 19140 (YELLOW 5 LAKE), CI 77491 (IRON OXIDES), CI 77891 (TITANIUM DIOXIDE). INGREDIENTS: TALC, MICA, TRIETHYLHEXANOIN, POLYGLYCERYL-2 TRIISOSTEARATE, C20-24 ALKYL DIMETHICONE, ETHYLHEXYLGLYCERIN, ZEA MAYS (CORN) STARCH, ZINC STEARATE, MAGNESIUM MYRISTATE, PHENYL TRIMETHICONE, ISODODECANE, SILICA, SYNTHETIC FLUORPHLOGOPITE, TAPIOCA STARCH, AQUA (WATER), POLYMETHYLSILSESQUIOXANE, STEARIC ACID, PALMITIC ACID, LAURIC ACID, DEHYDROACETIC ACID, CI 77007 (ULTRAMARINES), CI 77499 (IRON OXIDES), CI 77891 (TITANIUM DIOXIDE). INGREDIENTS: MICA, TALC, SYNTHETIC FLUORPHLOGOPITE, TRIETHYLHEXANOIN, ZEA MAYS (CORN) STARCH, TAPIOCA STARCH, SILICA, ZINC STEARATE, MAGNESIUM MYRISTATE, POLYGLYCERYL-2 TRIISOSTEARATE, C20-24 ALKYL DIMETHICONE, ETHYLHEXYLGLYCERIN, PHENYL TRIMETHICONE, ISODODECANE, AQUA (WATER), POLYMETHYLSILSESQUIOXANE, STEARIC ACID, PALMITIC ACID, LAURIC ACID, DEHYDROACETIC ACID, CI 77491, CI 77492, CI 77499 (IRON OXIDES), CI 77891 (TITANIUM DIOXIDE). INGREDIENTS: TALC, MICA, TRIETHYLHEXANOIN, SYNTHETIC FLUORPHLOGOPITE, ZEA MAYS (CORN) STARCH, SILICA, TAPIOCA STARCH, POLYGLYCERYL-2 TRIISOSTEARATE, C20-24 ALKYL DIMETHICONE, PHENYL TRIMETHICONE, ZINC STEARATE, MAGNESIUM MYRISTATE, ETHYLHEXYLGLYCERIN, ISODODECANE, AQUA (WATER), POLYMETHYLSILSESQUIOXANE, STEARIC ACID, PALMITIC ACID, LAURIC ACID, DEHYDROACETIC ACID, CI 15850 (RED 6 LAKE/RED 7 LAKE), CI 19140 (YELLOW 5 LAKE).